Time for a demo again. It's been a while now since the last demo, but that doesn't mean I haven't worked on anything. 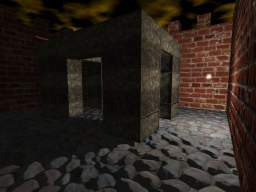 I have written a demo for the Beyond3D shader competition. I'll publish that demo here once the results are published. Anyway, while waiting for that I got some self shadowing bumpmapping goodness for ya. The 3D page has now passed 200,000 visitors. Now aiming for the quarter million. With a bunch of demos I suppose I can reach it before the end of the year. There is at least one demo coming in a very near future. The winter is approaching, and as the evenings become darker the spectacular shows on the northern skies begins to show up. Today a most marvelous northern light crossed the sky for a 5-10 minutes period. One of the most spectacular I've ever seen. 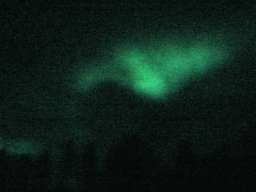 Often the northern light tends to be fairly static when it appears, or quite slowly moving. But today it was like huge blue-green flashes across the whole sky. You could almost see how wave after wave of sun-particles pumped into the athmosphere, causing huge stripes of light flapping in the solar wind. Further, the whole thing seemed to be centered in some kind of way right above our heads. Like when you put loads of metal particles on a piece of paper and go with a magnet under it and the particles form to a star pattern according to the magnetic field; that's how it looked in a giant pattern right over our heads, but kinda moving in the solar wind. This is one of the good things of living far north. While we may freeze our balls off, we do at least get to see some really cool shows regularly on the sky. Today, a really good one. Fortunately, I had the camera handily available in my pocket. Unfortunately, night photos isn't the strong point of this camera. Auto mode made nothing but black, manual with longest possible exposure turned out black too. Seems it needs at least something with a decent amount of light to be able to focus at all. 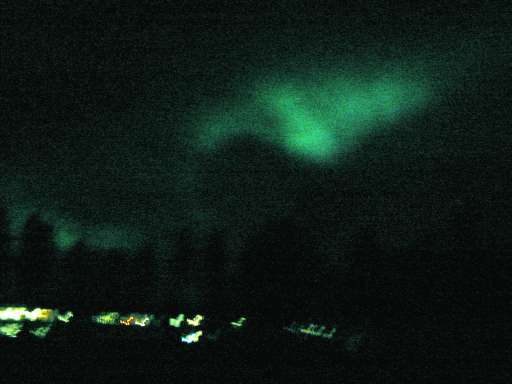 So only the shots aimed at the nearby houses actually resulted in an image where you could see the actual northern light, but it's not the main part and doesn't make the real thing justice. A slightly higher res image here. I'd recommend everyone to go up north some winter to around the artic circle or higher to see the thing in real life. 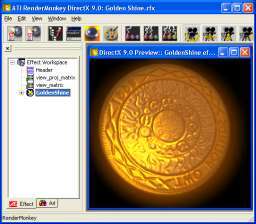 RenderMonkey v1.0 is now available on ATI's site. There has been plenty of improvements since the last beta. This version also contains loads of example workspaces to look at. Many of them are workspaces I did during my time at ATI. Check them out. Another two galleries are up in the Pictures section. With that my gallery uploading spree has ended and all the pictures I planned to upload is now online. Another gallery is up in the pictures section. This time its from the reunification of my the class from gymnasiet (roughly: senior highschool). There's two new picture galleries up from this summer in the Pictures section. The most interesting gallery IMO is the two day mountain walking adventure four of us siblings did to reach the 1769m high top of Norra Storfjället. Quite an experience and many beautiful images. There's also two short video clips from the top of the mountain with one taking a good look over the edge with 600m free fall. 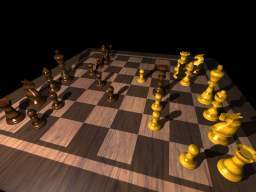 There's a new demo up doing an autoplaying chess animation with some cool graphics. Well, actually the demo isn't "new", it was done well before the summer, however, the timing with the completion of this demo and the driver releases gotta be the worst ever. A small driver problem held this demo back, it got fixed quickly, but the fix didn't make it into the next public driver released soon after. And no new driver went public before the summer either, thus the wait. But now it's here though, so enjoy!